Born in London, Eugene Ankomah is an internationally respected visual artist, mentor and personality who is both known for his many innovative but unpredictable styles of art, as much as for his ever changing self created “Art Persona’s” and evolving fashion sense. Having shown his work in many countries in Europe, Africa, and the US, he is an Artist with an uncommon natural ability that has seen him successfully enjoyed an art career for over 25 years, with many art awards under his belt, including major public and private commissions, coupled with the respect and admiration of followers world wide. 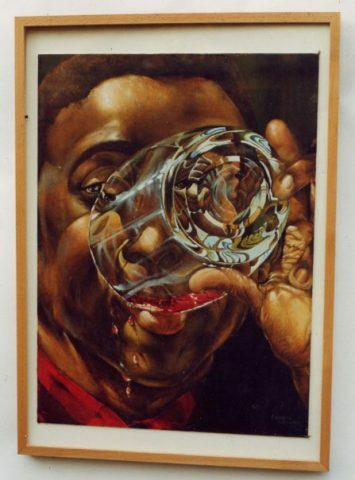 His works can be found in the collections of celebrities including Uri Geller, Colin Salmon, Michael Horovtz and Chiwetel Ejiofor but to name a few. Raised in the London Borough of Brent, Northwest London. He spent his early childhood living in Ghana with his parents and four siblings, before his family relocated to the United Kingdom in 1990. Ankomah first realized his love and passion for art as a child of four, when he recalls being obsessed with drawing boxes, and then moved on to drawing practically anything and everything around him, particularly members of his family and animals. From the very early beginnings he was recognized as a gifted child and described by many as an “artistic child prodigy”. Ankomah was a pupil at Willesden High School (London) from 1991, where he completed his secondary education. His unusual artistic talent was noticed by students, teachers and particularly encouraged by his art teacher, Mr. Graham Blackburn. At the age of 17years, Ankomah became the first ever recipient of the Peter Evans Award, (originally funded by the family of the late Peter Evans) awarded by his school for best student, winning a prize fund of £900 as part of the prize. Many other notable art prizes and Awards followed over the years. After completing his secondary education Ankomah followed a Foundation course at the prestigious Central Saint Martins College of Art & Design. He later also graduated in Illustration and Fine Art at the University of Westminster. Solo exhibitions and displays include Buckingham Palace London (Flag design) 2003, Carnaby St. London 2005, Gallery Technohoros Athens 2011, Art House London 2014, Royal Festival Hall, The Windmill London 2015. Ankomah has also exhibited with the annual Screen Nation Awards and his work and profile showed on ITV, the BBC, Sky TV and through other international TV stations amongst others. His work has also been featured widely in other media outlets including the Observer and The Voice Newspaper. Eugene continues to be dedicated to providing his experience and talent to charities, the less fortunate and the deprived, often making work to raise money for them. He continuous to be in demand for making presentations and talks with various youth organizations, schools, colleges seeking to empower and inspire. His work is in many private international collections. Currently, Eugene Ankomah’s diverse body of work stems from his fascination with the notion of Fear, Suspicion, Anxiety and Distraction within contemporary era. 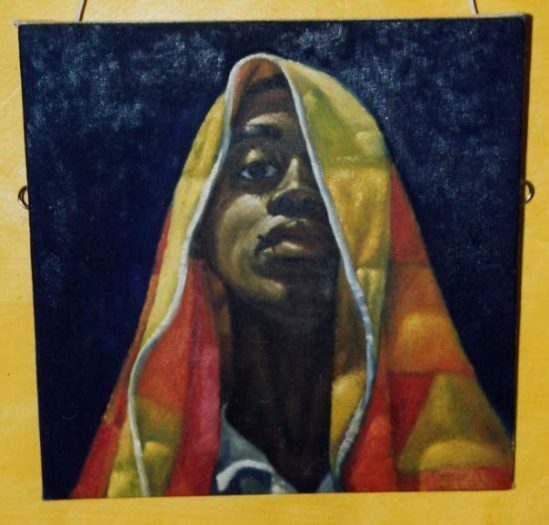 Many of his works take their cue from popular stories, childhood, current news, with references to race, religion, art history, politics, terrorism, false heroes, social injustice, the media, social media and symbolism. His series of mixed media paintings, installations and limited editions re-appropriate a diversity of imagery and text from popular culture, childhood Heroes to create a subversive twisted record of humorous yet disturbing scenes which incrementally build up the artists personal unique archive. 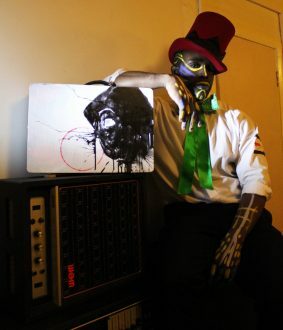 Ankomah although continues to push the boundaries of art via his Performance Art, and other unusual approaches to art making, including his notable choice of venues he’s exhibited in. He primarily considers himself a Painter with an interest in what he calls “The 3 dimensionality of the artist”- their ability to confidently pursue their voice via other creative avenues or practices with commitment and result. Eugene Ankomah lives and works in London, England.